MANHATTAN, NOV. 13 Sunny Jacobs and Peter Pringle with, from left, Brooke Shields, Marlo Thomas and Amy Irving. MOST married couples will tell you that the things they hold in common helped cement their relationships. 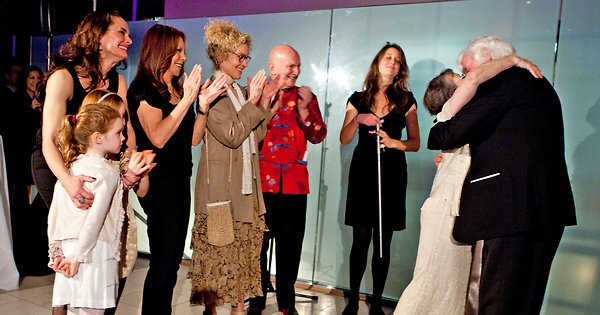 For Sonia Jacobs, 64, and Peter Pringle, 73, married in New York last Sunday, common ground was the decade and a half each had served on death row before their convictions were overturned for the murders that they steadfastly maintained they did not commit. Ms. Jacobs, known as Sunny, was born in Queens. She was living in Los Angeles in 1998 when she first encountered Mr. Pringle in Galway, Ireland, at an Amnesty International event she had spoken at that April. Mr. Pringle said he remembered being riveted as she reeled out the story of how a February 1976 car trip she had taken with Jesse Tafero, her second husband, landed the couple on death row. Behind the wheel, she said, was Walter Norman Rhodes Jr. (who had befriended Mr. Tafero during an earlier prison stint for both men). He was giving the couple a ride from Miami to the home of friends in West Palm Beach, Fla. Also in the car was Christina, the couple’s 10-month-old daughter and Eric, Ms. Jacobs’s 9-year-old son from her first marriage. At a rest stop off Interstate 95 in Broward County, a state trooper and his friend, a Canadian constable, pulled alongside their vehicle for a routine stop, which ended in a blaze of gunfire. Ms. Jacobs, who said that she and the children had been asleep in the backseat, contended that it was Mr. Rhodes who shot the two officers and then forced all of them, at gunpoint, to participate in his attempted getaway. A short time later, the police captured all three suspects and charged them with murder. Mr. Rhodes, who testified against the couple, plea-bargained with authorities, reducing his sentence to life. Mr. Tafero and Ms. Jacobs (her case further damaged by a cellmate who said that she had overheard Ms. Jacobs confess) were sentenced to death. In 1981, Ms. Jacobs won an appeal and the Florida Supreme Court changed her sentence from death to life in prison. But her spirits were dealt a blow in July 1982 when her parents, who were raising her two children, died in the crash of Pan Am Flight 759 in Kenner, La. “It was the most devastating time in my entire life,” said Ms. Jacobs, who wears her mother’s wedding ring, which was salvaged in the wreckage. Her children were cast into the foster care system, but Ms. Jacobs still had her husband, with whom she exchanged prison letters. But on May 4, 1990, with Ms. Jacobs still in prison, Mr. Tafero was put to death in a Florida electric chair. “The world had become a place I didn’t know anymore,” she said. They were eventually introduced, and Mr. Pringle, who had served a long stretch in Portlaoise Prison in Ireland, offered Ms. Jacobs a ride to her next day’s speaking engagement, a five-hour drive to Cork, Ireland. She agreed, and then Mr. Pringle made her a more unusual offer. He invited her for a swim in Galway Bay, which she accepted. “The sea has such a cleansing power about it,” he said to her. As they crossed the Shannon River the next morning, Mr. Pringle revealed to Ms. Jacob that he, too, was once sentenced to death, and that he, too, had cleansed himself in the waters of Galway Bay, in May 1995, after serving a 15-year prison term. “At that moment, I knew that the universe had put us together for a reason,” Ms. Jacobs said. He said that he had been 41 and the divorced father of four when, in July 1980, he was accused of being one of three men who had murdered two police officers following a bank robbery in Ballaghaderreen, Ireland. His lawyers won a stay of his original Dec. 19, 1980, execution, which was then reset for June 8, 1981. His hanging was only weeks away when, on May 27, 1981, Ireland’s president commuted Mr. Pringle’s sentence to 40 years without parole. Mr. Pringle, who is originally from Dublin and dropped out of school when he was 13, decided to serve as his own counsel. Six months passed before Mr. Pringle invited her back, this time to give a talk during a local concert he arranged in Galway. “During that visit, we fell in love,” she said. “We didn’t just share a past, we had a vision for a future,” said Ms. Jacobs, who has since spoken at schools, churches and other places across the United States and over a dozen other countries, alongside Mr. Pringle, on human rights and abolishing the death penalty. Ms. Jacobs re-established contact with her children and a granddaughter, who have scattered to Nevada and Australia; Mr. Pringle reconnected with his brood, who all live in Ireland. He said, however, that the past could not and would not be forgotten. “We will always feel each other’s pain,” he said. Nearly a year after Ms. Jacobs moved to Ireland, her story, along with those of five other wrongfully convicted death row inmates, became “The Exonerated,” a play put on by the nonprofit theater Culture Project that had its Off Broadway debut in October 2002. Ms. Jacobs was first portrayed by Jill Clayburgh, and 28 actresses have since played the role of Ms. Jacobs, a list that includes Mia Farrow, Lynn Redgrave, Susan Sarandon, Kathleen Turner, Brooke Shields, Marlo Thomas and Amy Irving. Ms. Shields, Ms. Thomas and Ms. Irving, however, were front and center. “Playing Sunny was so claustrophobic for me,” Ms. Shields said, her eyes welling with tears, “You felt her powerlessness, this was a woman in the wrong place at the wrong time, the same for Peter. As Ms. Jacobs and Mr. Pringle exchanged wedding vows and Irish Claddagh rings before Robin E. Cofer, a Hindu priest, the three actresses, all holding hands, inched closer to Ms. Jacobs. The Vows column last Sunday, about the marriage of Sunny Jacobs and Peter Pringle, misspelled the name of the city in Ireland where Ms. Jacobs had a speaking engagement. It is Cork, not Quark.